For the past weeks, we have been working on the production of the eMEDia Film, a new documentary video about the eMEDia project “A bottom up approach for the design and pilot of a joint master course in cross-media journalism”. The 16-minutes video tells the story of our activities and the results achieved working on cross-media journalism education in Tunisia during the last 3 years. 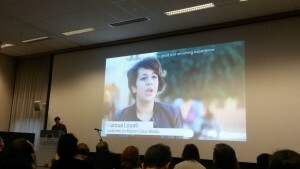 Today, on January 26 2017, the European Commission hosted the first presentation of the eMEDia Film during the Erasmus+ CBHE 2016 Grant Holders Conference in Brussels. Marcello Scalisi, UNIMED Director, introduced the film. The eMEDia Film illustrates the cooperation process among the European and Tunisian partners involved, the activities carried out to design and pilot the 2-years professional master course in cross-media journalism, the results achieved, and the impact on the higher education sector in Tunisia. It contains testimonials of project partners, professional journalists, teachers, students in the master course, and the main players who have contributed to make the eMEDia project a success story of cooperation. We gratefully acknowledge the significant contribution made to this video by IULM Communication, the teachers, and the students at the University of Sfax. We hope this video provides you with a good picture of our project, and we are eager to hear comments from others with insight or interest in this area.